What is the correct way to scale results when taking the Fast Fourier Transform (FFT) and/or the Inverse Fast Fourier Transform (IFFT)? In most situations, scaling is really not all that important. The overall shape of the spectrum matters much more than the absolute scale. Scale by 1/sqrt(M) for the FFT, and by sqrt(M) for the IFFT. I generally use either option #1 or option #2 depending on my mood and whether it's raining outside. Here I am assuming that I have a discrete-time signal x represented as an M x N matrix, where M is the number of samples and N is the number of channels. What do all these conventions have in common? All of these conventions have one thing in common: The product of the two scaling factors is always 1. Please note that the ifft function in MATLAB includes a scaling factor of 1/M as part of the computation, so that the overall round-trip scaling is 1/M (as it should be). If my scaling is 'dt', for 1-Dimension, is it should by dt^2 for 2-D, please ? Incidentally, you should probably turn this into another question. answer worked in case the reconstruction has the same length with original signal. What if the reconstruction has more length in order to do some prediction, How would you scale the ifft ? I am using ifft for my problem. The thing with it is, if I multiply my ifft results by number of sampling points, I get nearby i.e. expected results. is it right to do so? Also, is it necessary that my sampling points should be of the form of 2^N. Another test is to create a spike in the time domain with amplitude equal to Fs, then ensure that the magnitude at each frequency is unity after scaling. In your case, if the increments in the x- and y-direction are equal, then yes either dx^2 or dy^2 will be appropriate. This answer works out, but confuses what is actually going on. The frequncy domain data (b) is first multiplied by dt (b=fft(a)*dt). It is then squared (b. *conj(b)) and finally multiplied by df. The net effect is dt^2*df. Since df is defined as 1/(dt*N), this reduces to dt/N. The reason dt and df are not needed for Parseval's theorem in the discrete domain is because dt and df are associated with continuous integral. I am still sorting out the scaling. It seems like option 4 from the original value satisfies Parseval's equation. However, option 2 seems to mainatin the relationship between amplitudes (looking at DC levels) and has been suggested in a Matlab technical note (1702). There is also some good discussion about 1702 in Matlab Central. In the continuous case, dt and df are infinitesimal quantities, which approach 0 in the limit that defines the Fourier integral. In the MATLAB code, dt and df are variables that take on values that are strictly non-zero (and positive). So the variable dt in the code is not in any way the same thing as the infinitesimal quantity dt in the continuous Fourier integral (and likewise for the variable df versus the infinitesimal df). Moreover, the fft function is an implementation of the discrete Fourier transform (DFT), not the continuous time Fourier transform (CTFT). Johnathan, not sure what I am confusing here. I would suggest you look at the answer from "Chani" below in addition to my comment to their answer. Multiplying the output from Matlab's FFT function with "dt" is the only way to approximate the correct amplitudes (if you care about having physically meaningful amplitudes) AND allow for Parseval's theorem to be satisfied. Just to follow Rick's comment and clarify my notation - when I say "dt" or "df" it is meant as a "delta-t" or "delta-f" (as in a discrete time or frequency increment), respectively. Dr. Seiss, I want to thank you for helping me finally arrive at the correct scale factor to use for Matlab's FFT. I've been using 1/N for decades, and it usually isn't a problem since I most often go back to the time domain with N. However dt is the correct scale factor for FFT due to Parseval's Theorem as you made very clear. I would like to add this regarding the scale factor on IFFT: If Matlab did not internally scale their IFFT function by 1/N, then the correct scale factor to apply to IFFT would be df. However, Matlab does scale their IFFT by 1/N. 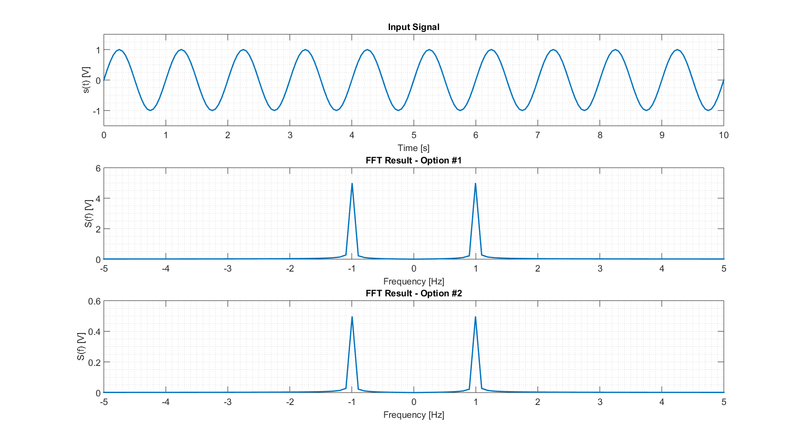 It allows the FFT/IFFT transform pair to give the same result when transforming to frequency and back to time domains. I have seen so many subjects related to this issue and so don't know on which to put my answer...I hope this can help some people. I can see there are mainly 3 groups of people, those saying that is not important, those dividing by the number of points of the signal, and those dividing by the sampling frequency. first, for some applications,yes the correct amplitude is important. for example, the magnitude of an earthquake is computed from the amplitude of the spectrum. then I agree with Dr Seis, the correct way of scaling spectrum is multiplying by dt. Fs being the sampling frequency, df the step of the frequency vector. the matlab fft outputs 2 pics of amplitude A*Npoints/2 and so the correct way of scaling the spectrum is multiplying the fft by dt = 1/Fs. Dividing by Npoints highlights A but is not the correct factor to approximate the spectrum of the continuous signal. The second point is the parseval equation. I have seen many people saying the fft can not respect this relation or is not applicable in discrete mode. first, in discrete mode, if should tends to the continuous value. if can not be Npoints lager or smaller. And, if the fft is multiplied by dt, the energy of the input signal equals the energy of the spectrum. the relation is satisfied if the fft is multiplied dt and df is correctly defined. Moreover, there are many simple typical Fourier transforms such as exponential decay, triangle function.. you can model the temporal signals and the known continuous transforms and check that fft*dt is the correct way of approaching the continuous transform. MVDR in multipath environment with high resolution method hi,how to simulate in matlab doa by mvdr in multipath environment and better performance by high resoultion method(esprit-music-wsf-spatial smoothing....)? I tried both options mentioned above, namely option #1 and option #2 with a simple sine curve. The results of both options confuse me and I am hoping you can help clear things up. From my point of view the result of option #2 exhibits the correct amplitude of 0.5V, since the time signal has an amplitude of 1V and this value is split into the two impulses on the negative and the positive frequency scale. Does this mean, if I am interested in the real amplitude of the signal, I have to use option #2 and if I want to preserve the energy of the signal option #1 has to applied? Both graphs are correct, but each graph tells you something different. Remember, neither one of these graphs is showing you the spectrum itself, but rather each is showing you a discrete sampling of the spectral density versus frequency. The only difference between the two graphs is a simple scale factor, which represents nothing more than a difference in the units of measure for each graph. For Option #1, the graph represents the spectral density in units of volts per hertz. For Option #2, the graph represents the same spectral density, but now in units of volts. The scale factor is nothing more than the value of df (in hertz), the frequency increment between each adjacent pair of discrete frequency values. Rick, for Option #2, the graph represents spectral density in units of "volts per sample" (not simply "volts"). Until you supply the correct value used to sample the data as a "scale factor", the amplitudes are physically meaningless. Also, if you do the actual Fourier Transform of that example SINE wave (with limits from 0 to 10) you will find that the amplitude at f=1Hz SHOULD be 5. So really, option 1 satisfies the amplitude issue and Parseval's theorem. The point I have been trying to make in this post (and several others around "Matlab Answers") is if you are trying to approximate the Fourier Transform for a periodically sampled time series that is finite in length, then there is only one way to scale the output from the FFT function in Matlab - multiply the result by dt. Doc Seis.....have you got an example to show this? I'm thinking of a portion of a sinusoidal signal that digitally spans 1 period..... such as N points, where point #0 is the start point, and the point #(N-1) is the LAST point (such that the following data point would theoretically be the same as point #0 again). The data set will be 'N' points. For this case, the scaling should still be 'divide by N', right? If instead we multiplied the result by the sampling period, then the FFT magnitude amplitudes wouldn't look right..... right? How is it possible that the fft computed with matlab (no particular scaling!) and the FFT obtained by utilizing Xilinx module for SystemGenerator, have a 2000x factor scaling difference? i.e. Xilinx one is 2000 times lower amplitude? IMHO, if the input signal is x(t) is real, only about half of X(f) = fft(x)(f) is relevant (index 1:ceil((N+1)/2))) the other half is just conjugate of the flip of the first part, so the Parseval would be matching the integration of X(f)^2 on [0,1/(2*dt)] (up to Nyquist frequency) and one must multiply by an extra factor of abot sqrt(2) on top of dt on fft(x(t_i)) to get the Parseval equality up to Nyquist frequency (and not beyond that). Some subtle consideration: if N is even, the frequency ceil((N-1)/2)*df count only once so it should not be multiplied by sqrt(2). The same for static term (f=0) for all the cases. A factor of sqrt(2): it can make a bridge resists or fallen down.